Need to find a pet friendly hotel in Breckenridge CO? Click the Pet Friendly Accommodations Button below!" Breckenridge welcomes traveling pet owners with its year around activities. The town sits at 9600 feet at the base of the mountain which rises to 13,000 feet offering both summer and winter recreational opportunities. Winter brings some of the best powder skiing in the West. 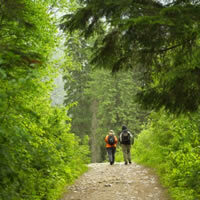 During the summer you can hike, visit waterfalls, ride horseback and participate in the many fairs and festivals. 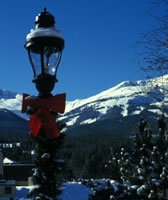 In 1859, gold was discovered at the base of the Blue River, and Breckenridge was established from a base camp. Today, Breckenridge contains more than 350 historic structures, making it the largest historic district in the state of Colorado. Try your hand at panning for gold at the Country Boy Mine Tour (970-453-4405). 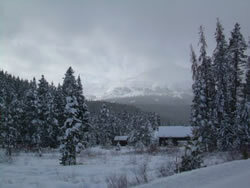 It was not until 1961 that the The Breckenridge Ski Area officially opened. It had one Heron double chairlift and a short T-bar. Almost 17,000 skier visits were recorded that first season, despite the fact that Interstate 70 was still not complete to Summit County. 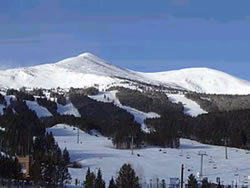 Today, Breckenridge boasts the country's highest capacity ski lift and the first double loading six passenger chair lift. As you can see, this area takes its skiing seriously. Additionally, Breckenridge was the first to endorse snowboarding over 20 years ago. Today, there is no shortage of challenges, from the beginners to the legends. Other popular winter attractions are ice skating, dog sledding, and Tiger Run, a daily, two-hour snowmobile tour through the backcountry (970-453-2231). Just remember that your pet will be waiting for you when you come down from the slopes. Check with your hotel's concierge for a list of pet sitters in the area. 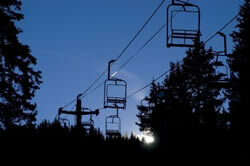 Although Breckenridge is noted for its winter attractions, don't count out visiting this beautiful area in the summer. Mountain bikers can enjoy the rigors of pedaling at higher heights and taking in fresh mountain air. Hikers have an abundance of trails to choose from in order to escape the sights and sounds of civilization with their pets. Feeling adventurous? Try an early morning hot air balloon ride complete with champagne and continental breakfast through Colorado Balloon Rides (970-468-9280). It's easy to find pet friendly hotels in Breckenridge with PetTravel.com. Just click the SEARCH button above for a list of pet friendly hotels, motels, bed and breakfasts, small inns, and vacation rentals in Breckenridge. If we have information for other pet friendly services in Breckenridge, a second search button will appear that will include pet friendly beaches, parks, and other fun things to do with your pet. We welcome your emails regarding pet friendly services in your town. Just send an email to info@pettravel.com and we will add them to our database. Come back often as we are always adding new and exciting places for you to visit with your pet. We even offer pet sitters in selected cities who will "petsit" your best friend while you go out to dinner in Breckenridge. Traveling by Air? You can find airline pet policies and airline forms for all the major airlines in the world. Search for all of the pet friendly information and resources you need for a perfect vacation with your pet on PetTravel.com!